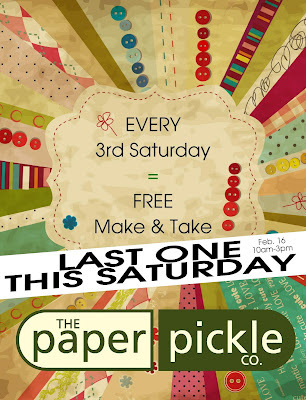 Saturday is our LAST Make & Take...! Store Closing - ONLY 2 WEEKS Remain! Looking pretty and classy right up until the end.....oh I'm going to miss this gorgeous space! TODAY is the LAST DAY at 44 Fourth Street. Join us and walk away with INCREDIBLE SAVINGS! 60-90% off. You will not see savings like this again. Our selection is still wonderful and current. How beautiful is this? Last night Jules and I were at the store prepping for the last day. We had the Taylor Swift blasting (girl power!). We were working together to make it beautiful for you right up until the end. Anyways, things were getting shuffled around and the stamps lost their home. I looked around and found THE perfect spot....back on our signature shelving....just as they were back in 2003 when we set up. This made my heart happy. How gorgeous are they with their reinker friends? Awe. I cannot believe we are here. 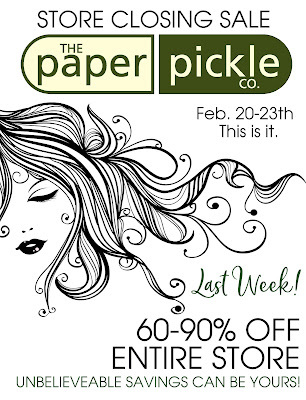 The LAST WEEK of The Paper Pickle. Thank you to everyone who has been in to shop and share their well wishes with me. It has been an incredible 5 weeks. You have helped me to keep my head held high. This has been a wonderful and awesome ride...all 15 years of it! Saturday is our LAST DAY so these are THE BEST prices you will EVER see. Take this beautiful product home with you. Oh wow. Saturday was quite the day! Thank you to everyone who stopped in for our LAST Make & Take. 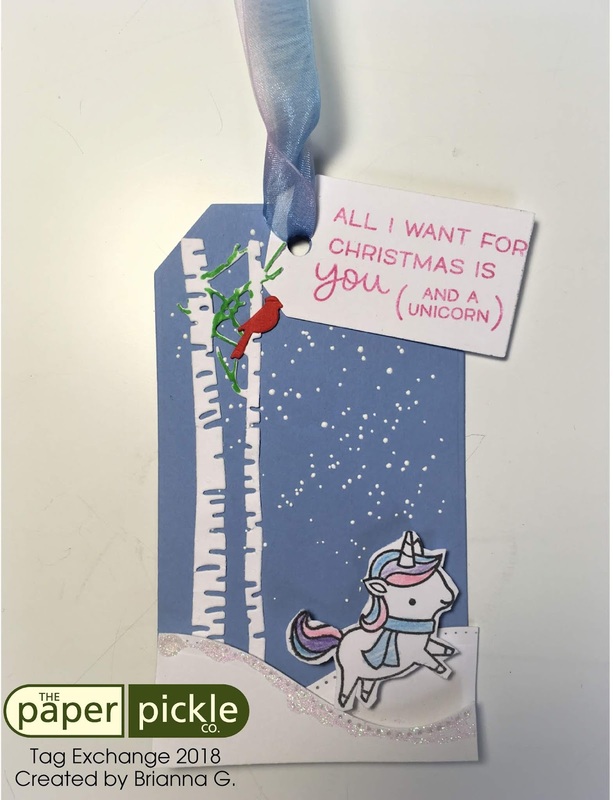 I wanted this make and take to be EXTRA special. I wanted to thank you for the "good times we've had.....the good times we knew" (-Tom Cochrane). Oh and BOY we have had some good ones! 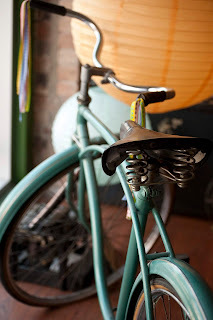 Many of the fondest memories I have of The Paper Pickle involve this girl here....our mascot....our bike. It's funny but I don't think we even named her. All I know is that she has been with us since our BIG move to 4th Street in 2005. She has been apart of our store and she HAD to be apart of our LAST make and take. We thought it would be fun to have a little photo booth. People got to ride the bike and pose with some funny little signs. 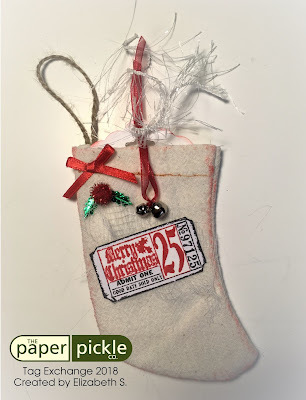 The Paper Pickle is all about making memories and I wanted to make a few more with you! Thank you to this crew. Julia has been such an incredible help over the past couple of years. I loved watching her confidence grow with each and every month. And thank you to her helper, Brody. He did so well with the photos and even helped by modifying the flow of the process (Look out for this guy in the future. He is going places!). Oh this is just me having a little fun. Oh, how I LOVE this space and this store. Thank you to my beautiful sister, Krystle for these photos from the day. You have captured so many special moments for us. We are so lucky to have a professional photographer in the family. 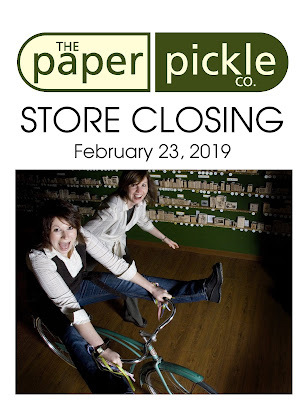 One week to go.....our LAST DAY is THIS SATURDAY (February 23). Our mascot is ready for one last ride. 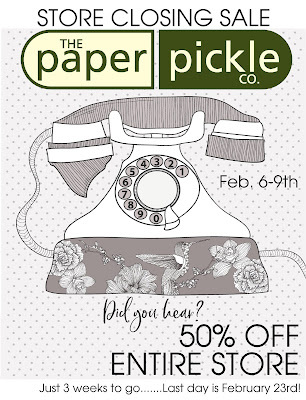 Our incredible sales continue with 75% OFF all paper (I know!) and 60% OFF everything else. YES....this means 60% OFF the clearance items as well. With only 7 days left, there is not much time to get in and save. I'm leaving on a jet plane.....I don't know when I'll be back again. While I was designing the poster above, I just couldn't get that song out of my head. It has always been a favourite of mine. I love the John Denver version but I adore the Chantal Kreviazuk version. Probably because I have seen her sing it live a few times here at The Kiwanis and Capitol Theatre. Such a beautiful and simple song. But let's not be sad. Let's get pumped for some WILD sales this week....and they ARE wild! 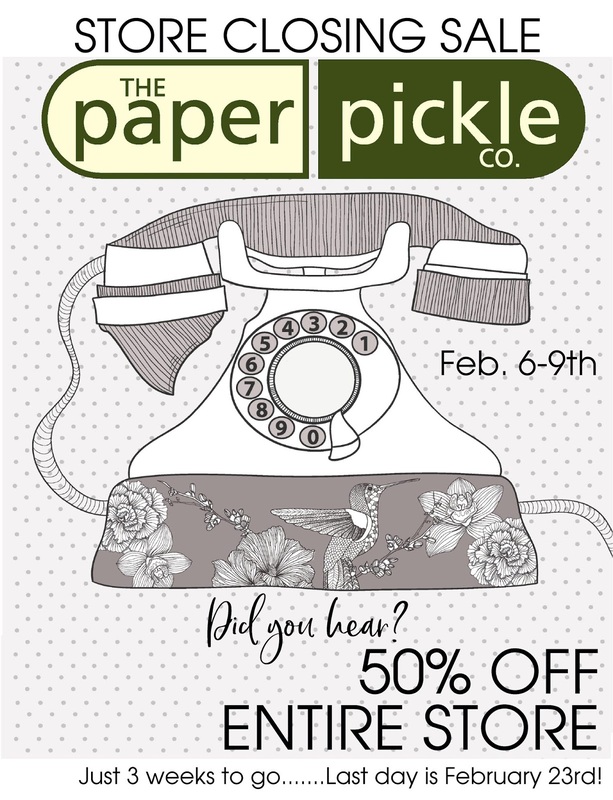 ALL paper is NOW 75% OFF! This includes: matte and shimmer cardstock, designer 12x12 papers, and envelopes! What?!? I know! AND all other items in the store are now 60% OFF. This includes: stamps, dies, embellishments, stickers, ribbons and more! Our selection is still wonderful. Stop in and check it out for yourself! And be sure to spread the word. What a perfect time for the schools and various organizations to add to their crafting supplies. Envelopes in all sizes - A2, 6x6, A10, 5x7, etc. Ribbon - Sold by the yard or spool - 100s to choose from! all at 50% OFF the clearance price...! With only THREE weeks to go, it is TIME to get in. Hope to see you soon! It's WEDDING WEEK! Attention: Brides and Party Planners! Calling ALL brides and party planners! 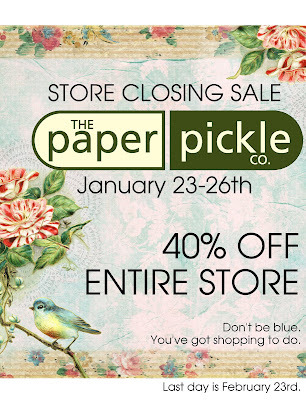 After 15 dill-ightful years, it is time to close the doors at The Paper Pickle Company AND this means BIG savings for you! This is the perfect time to pick up supplies to make your wedding invitations or next Pinterest project! 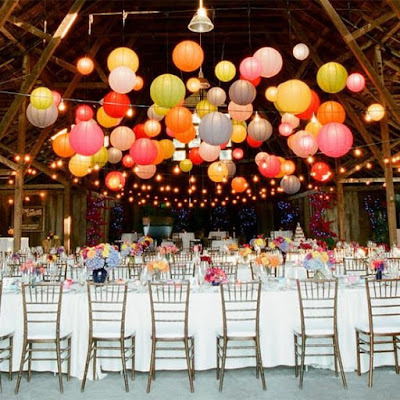 Beautiful Paper Lanterns add charm to any party! We also have a wide array of paper lanterns at 40% OFF. Don't they look pretty at this event? I hang them from trees during my summer parties or through the house during my winter parties. They are so fun! The small are now $1.50, medium $2.10 and large $3.90! We have the guest book, pen, ring pillow and basket. 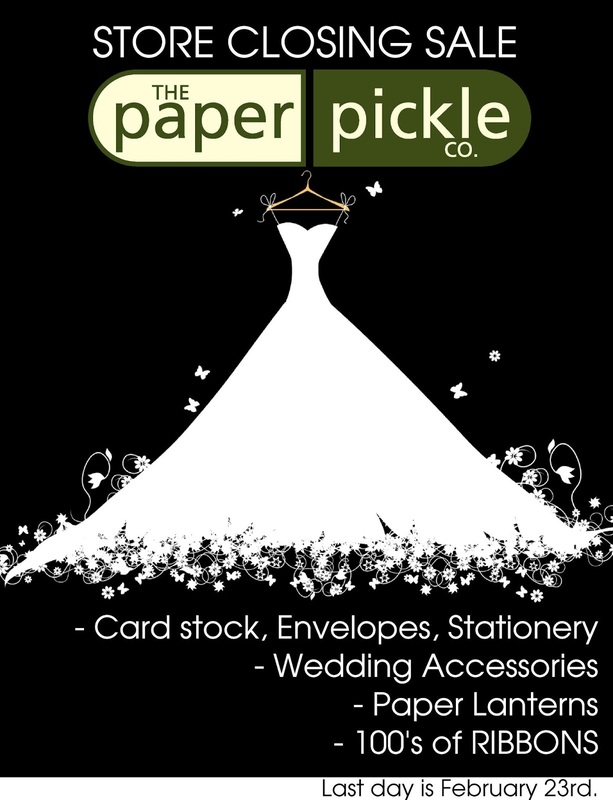 Wedding Accessories - Great Savings to be Had! 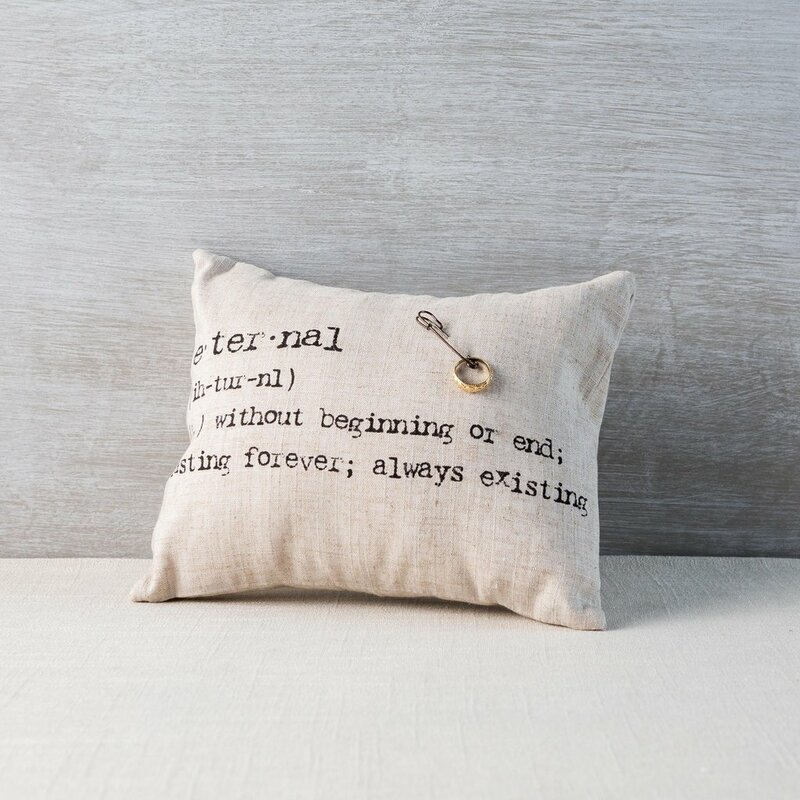 Enjoy DEEP DISCOUNTS on ring pillows, guest books, favours, and more. It is THE perfect time to stop in! Shop and earn POINTS towards Bridal Confidential cover contest!! Last year, one of our brides WON the cover contest thanks to the points she earned with us. Oh wow. Last week was quite the week! I have never experienced so many different emotions all in such a short period of time. You had me laughing out loud as you reminded me about stalking Paris Hilton at the Winter CHA show. You had me in tears when you were posting how sad you were about the closure. 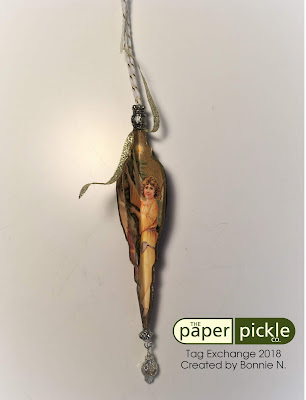 You had me beaming when you said that The Paper Pickle has always been your happy place. Thank you for taking the time to comment. This has really helped me ease into this transition period. Well ladies, one thing sounded loud and clear last week......YOU. LIKE. SALES! And so do I. So let's keep the FUN going! 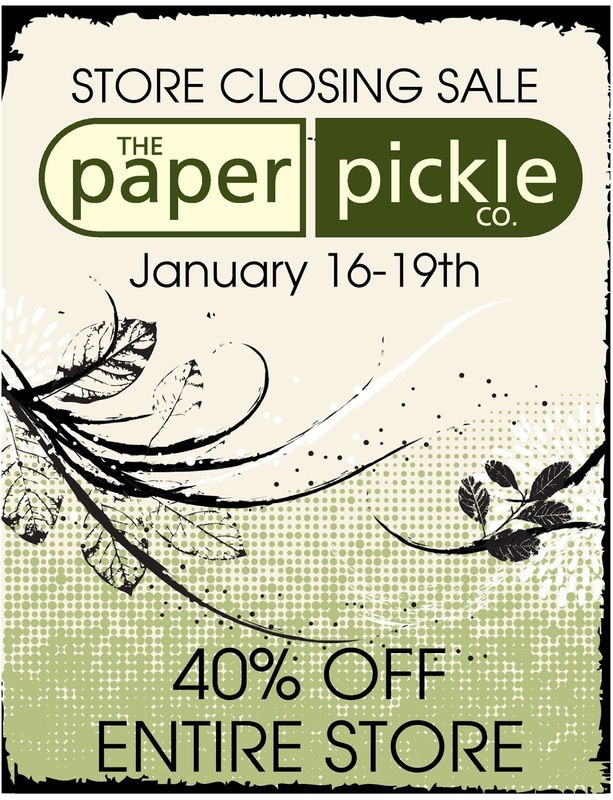 This week enjoy 40% OFF the ENTIRE STORE. 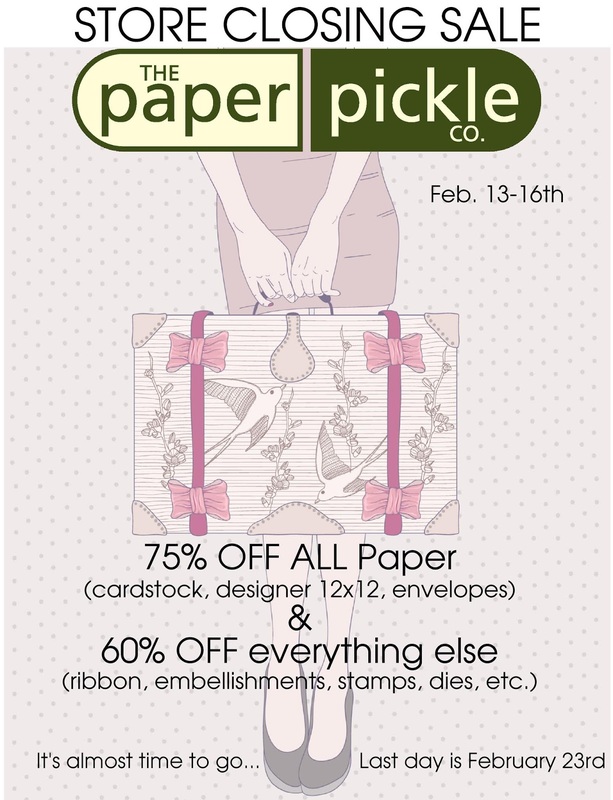 There is still an INCREDIBLE selection of designer 12x12 paper, cardstock, envelopes, rubber stamps, dies and more. Get in while the gettin's good! Another thing that you liked was the later shopping on Thursday night. Let's keep that going too! I will be open until 8pm. Stop in and see me. It has been one wonderful and AWESOME ride! I wasn't sure when this day would come but it is here. 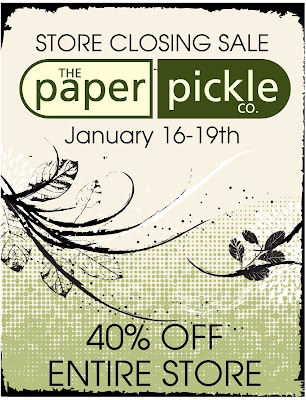 It is time to close the doors to our beautiful store at 44 Fourth Street, Chatham. I have been searching through boxes and flipping through photo albums. I have been rummaging through drawers at home and drawers at the store. I have been scrolling through my beloved blog. (Oh my blog!) All of these efforts were in hopes to find THE perfect picture or note that would prompt me to write THE BEST farewell post. And you know what I found? Not one but many....SO MANY (!) paper clippings, ads, stories, photos......all of which have flooded me with emotion. No single piece of our history could help me with this post. 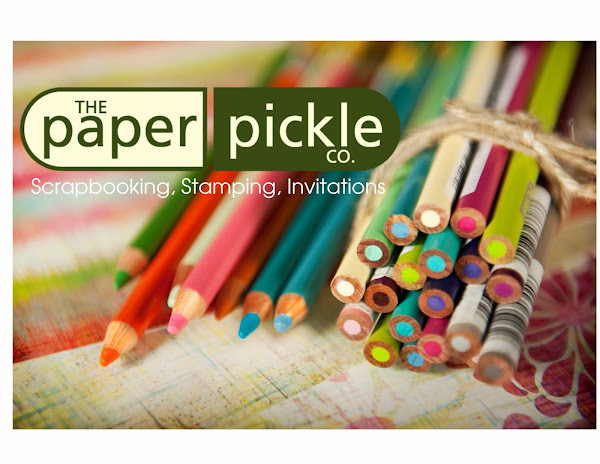 For 15 "dill-ghtful" years, The Paper Pickle has been providing you with THE latest and greatest in paper crafting products. My sister Kelly and I started the store because of our love of the hobby. We were WILD and still are wild about paper. Remember that time I told you about how we spent our very first earnings (hoeing for our dad) on beautiful scented puffy stickers from Toys R Us? And remember the time I had my three sisters up until 1am two nights before my wedding to help me heat embossing my menu cards? (Side note - they did look stunning in a traditional gold on mint green vellum....all thanks to supplies from Rubies!) And remember the time I told you how we felt when we got our very first wholesale order? It was from River City Rubber Works and we frantically TORE into the box on my dining room table....oh, it was like Christmas! It has always been like Christmas. We have felt great anticipation for each and every event we hosted and/or took part in. We have always put our hearts into EVERY detail and EVERY preparation. And like Christmas, when the event arrived, oh wow! The great JOY and PRIDE we felt was truly overwhelming. You would tell us that we had the nicest booth or the most beautiful card. You would tell us that we were your HAPPY PLACE and where you needed to visit to escape. You liked us.....you really liked us. This response and YOUR support gave us energy and kept us petaling all these years. It has been one wonderful and AWESOME ride. 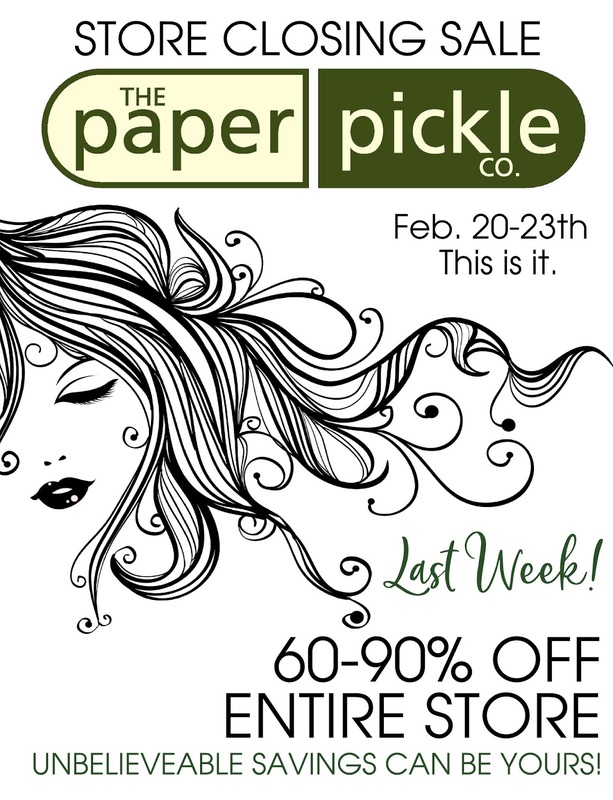 Sale starts Wednesday....Spread the word! I could go on and on here but I better not. I do hope, however, you will allow me to share a few stories with you over the next 6 weeks. I am amazed at the history I have uncovered including how my hair has transformed over the past 15 years?!? Honestly, what was I thinking with that cut (or lack thereof) in the photo above?! Ha. You can help me by spreading the word that the LAST DAY will be February 23 and by passing on our specials with your friends. 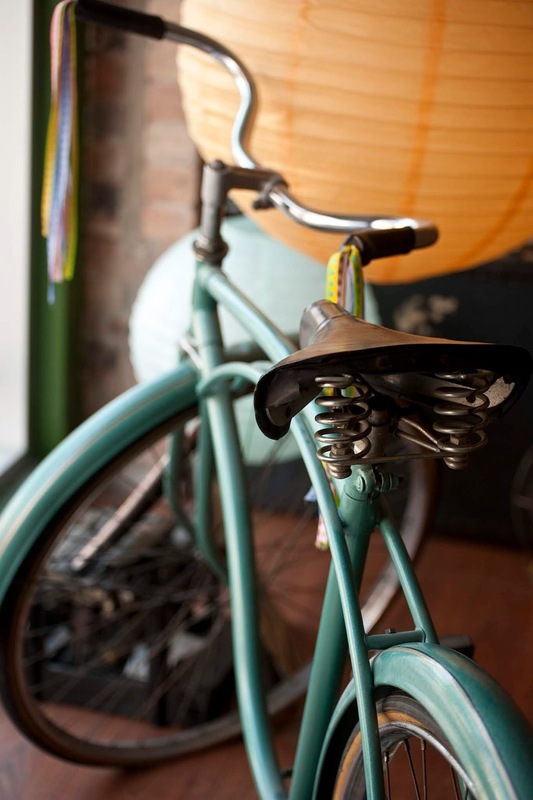 As you know, we have beautiful, current product in the store ALL looking for a good home. And at 40% off? You better grab it before it is gone! We will be offering extended hours for your shopping convenience. We will be open until 8pm THIS Thursday. Come and see me and share your favourite hairstyle story with me! Homebaked Kitchen is NOT Closing! You will be thrilled to hear that my sister Jen is NOT closing her incredible bake shop but rather MOVING her business. She is still working out the details but I promise to keep you posted. You can help by spreading this news as well. I would hate for my decision to negatively affect her business. Thank you in advance for your help! 2nd Last Make & Take - THIS Saturday! As you know we have this cool thing that happens on the third Saturday of each month. 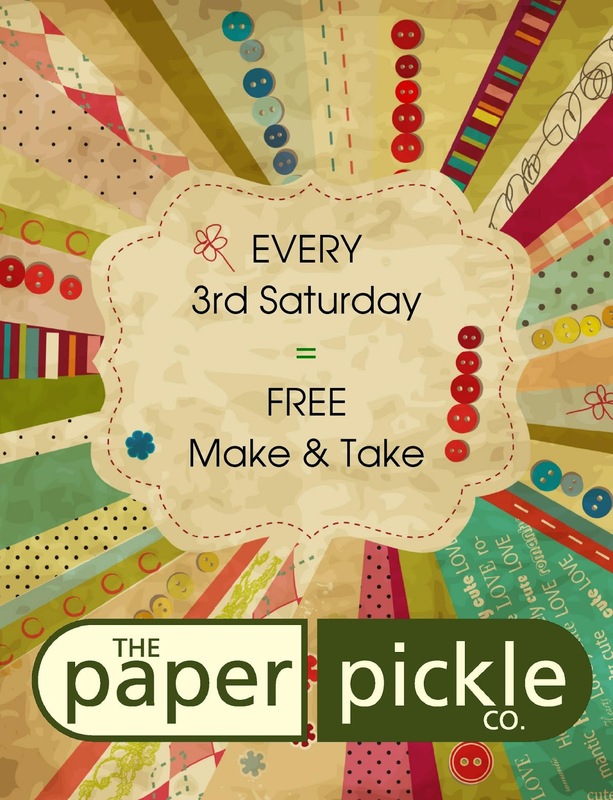 We host a FREE make and take where you get to make a fun project lead by my daughter, Julia. Join us THIS Saturday for our 2nd last event. It will be awesome. Stop in anytime between 10-3pm. So? How did I do? I will admit that I had a few tears while I wrote this. Thank goodness I didn't do a farewell video.....no one needs to see that! But in all honestly, please know that a tremendous amount of thought has gone into this decision. I hope you understand and I am not letting you down. ***Please note that hours may be extended on other dates based on your feedback. Please let me know your thoughts. We would love to see you before we close! I just HAD to take a picture of all my tags before I shuffled them into the bags. I LOVED pumping these out. This Magenta stamp is still one of my all time favourites. Happy New Year! It is time for my annual post where we reveal the incredible talent in our Paper Pickle community. The women have once again blown me away. I am like a kid when the tags start getting dropped off. 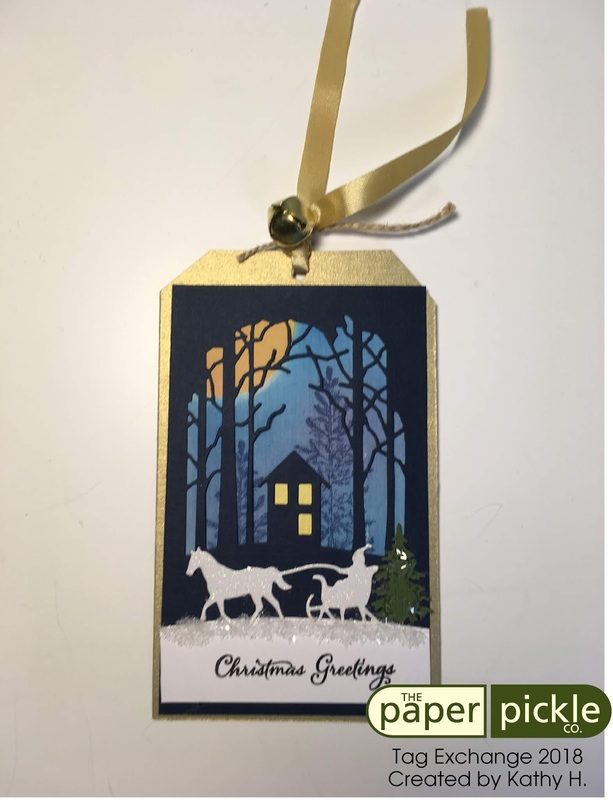 Christmas tags are awesome to work on because the possibilities are endless: classic reds and greens, bright colours, elegant, rustic, santas, snowmen, snowflakes, angels, trees and more. This year's swap was delightful. 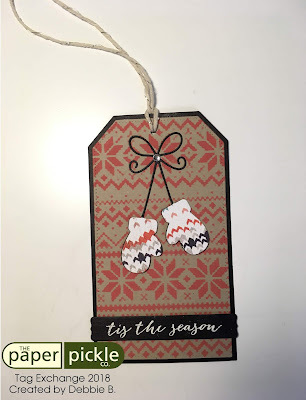 Feast your eyes on these tags! Please note that tags are posted in alphabetical order by first name (honestly, I couldn't pick a favourite if my life depended on it!). Ha. Also, all of the tags are now on display at the store. Please come by and see them in person to see their true beauty. I try to capture it here with my pics but in person is always MUCH better! 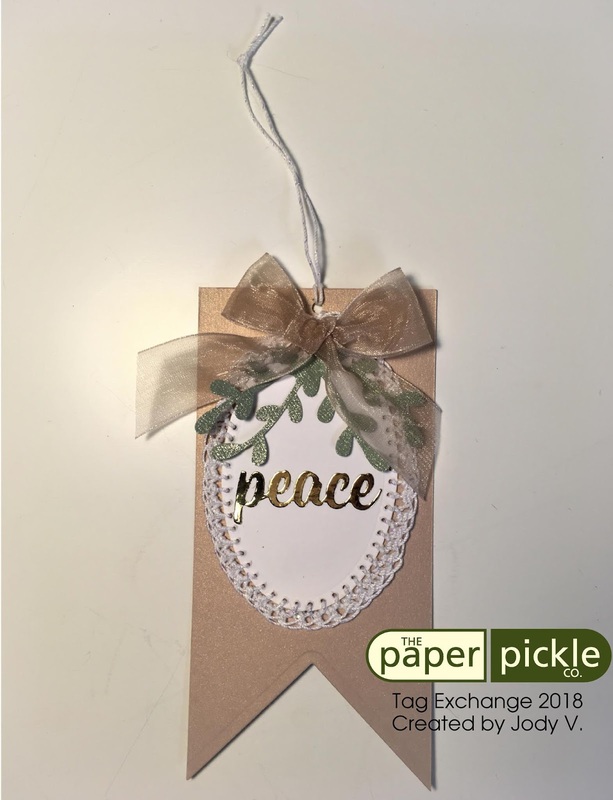 Barb created not one but TWO stunning tags for the exchange this year (see below for the gold version). This tag is over the top elegant. There is everything from mirrored paper, glittered paper, shimmered cardstock, sequins, and vellum. The background is also incredible. 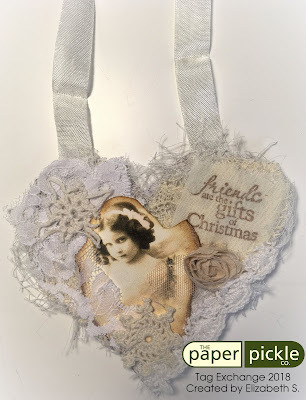 Barb used distress oxide inks (my fav!) to create a stunning evening sky look. 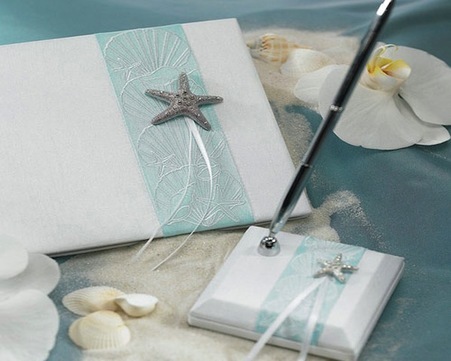 The subtle pearl shimmer ink splatters were a beautiful touch. Bravo. This is Barb's second version. It is equally as beautiful in the whites, creams and golds. Awesome. Bonnie is another one who likes to submit two tags. Ok. 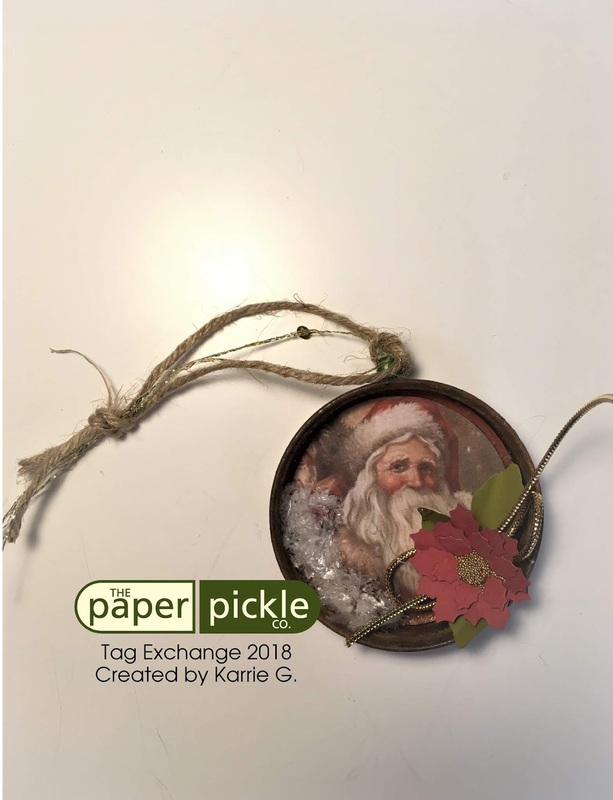 So check out how whimsical this tag/ornament is! Snowmen have always had a special place in my heart and especially this guy with his cardinal friend. Subtle touches of glitter and rhinestones really dress this creation. 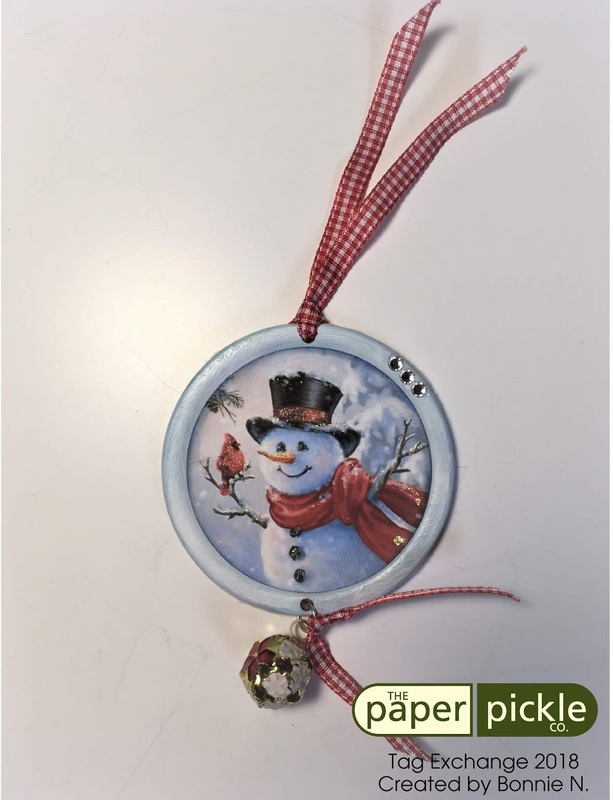 Bonnie has even finished the tag with felt on the back and a gorgeous jingle bell. This will be going on my tree next year! So there is no doubt about it....this tag IS an ornament! You HAVE to see this one in person. 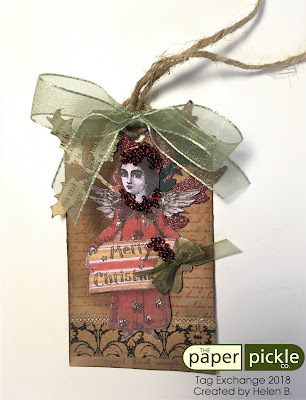 I am in LOVE with the vintage angel paper (there are four different angels on each side). Now I have a suspicion that Bonnie is also a jewelry maker because of her beautiful use of beads etc. I must ask her next time she is in! Brilliant, Bonnie! Our youngest paper crafter did SO well this year. 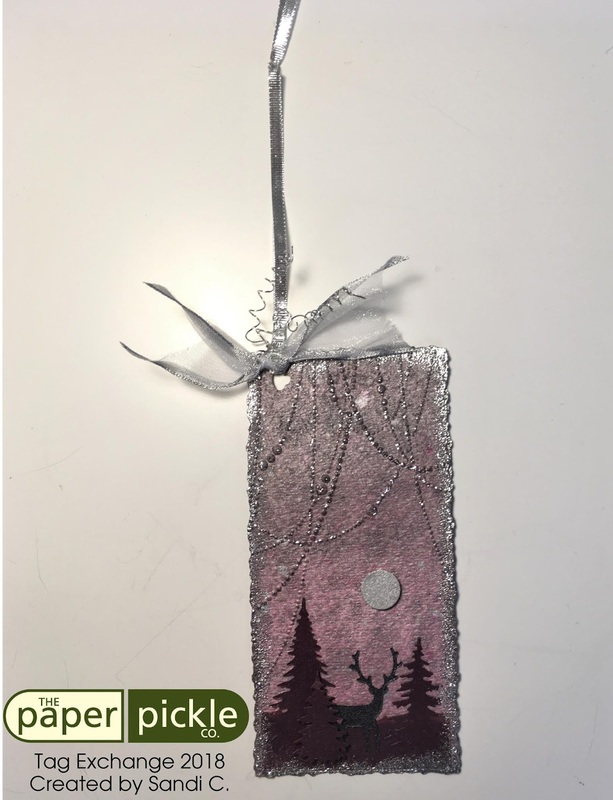 Brianna used one of my favourite stamps by Lawn Fawn to create a magical winter scene. Again....there's that cardinal! I love the soft pastel palette that Bri used. Awesome job!! Carol always creates a tag that is clean and elegant and I wish I could do that! 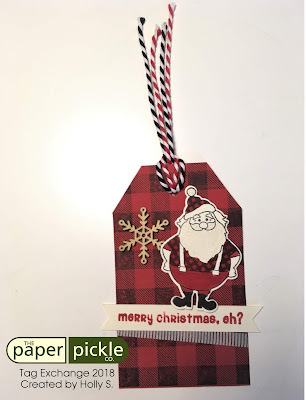 I adore the warm plaid colour tones and jingle bell at the top. 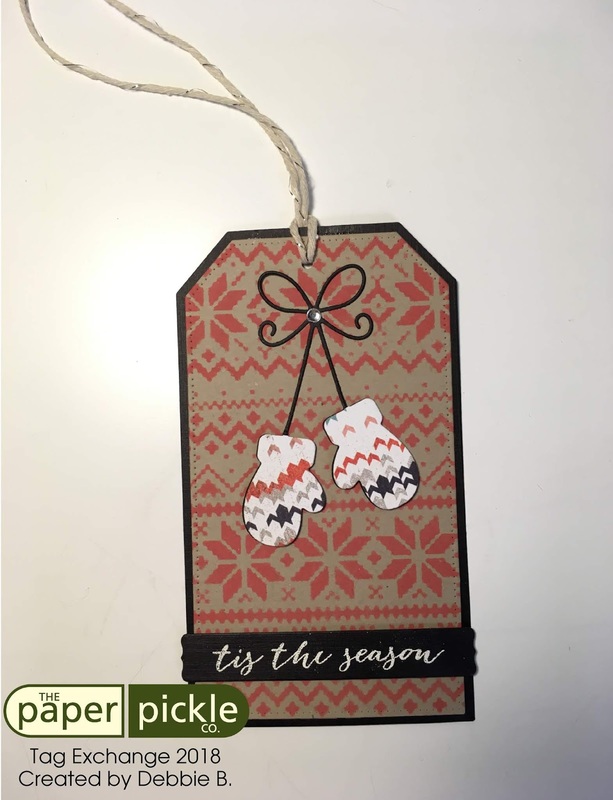 And Carol is a smart crafter too....She punched the snowflakes out of the mitten and then added those punch outs to the tag.....smart....smart....smart! Debbie's tag is so warm and cozy. 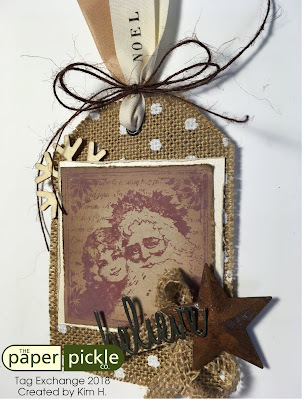 She used my favourite oxide inks and Tim's stencil to create the entire background design. The pairing of this kraft/red combo with the black touches is perfect. Love that stamp too. Very nice! Oh wow "Aunt" Debbie! Your design was such a treat. The peach tone you chose was such a pleasant surprise and I don't think anyone has used this combination in our tag swap in the past. This tag SHINES! I love the tree in the brown bling card stock, the beautiful sequins and the inka gold wash....that really sets off the tag. Gorgeous! Oh Donna! I love this little guy. 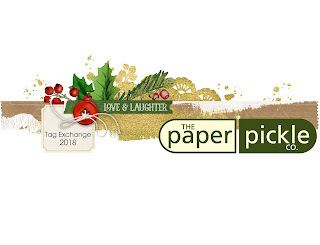 All of your papers were perfectly chosen to make this tag a show stopper. 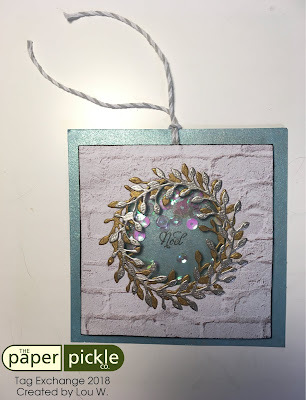 And when you are in, check out how deep the embossing is on this background! The little touches on the holly berries and snowflakes did not go unnoticed. Beautiful! 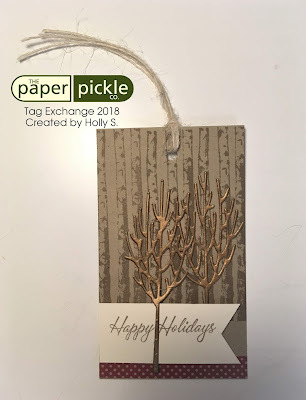 Helen's tag had me wanting to get working on a mixed media project like immediately after looking at this. Is this not awesome?! 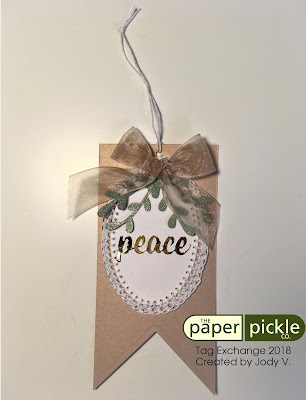 I love the various papers she chose for the holly and leaves. And the washi tape really dressed the design. Those seed beads were amazing! The resident Queen of Technique did it again. She worked with her embossing folders and inks to create a wonderful background design. You will also see a stunning script stamp in brown and distressed edges to match her glossy brown wreath. Nicely done, Hilary! Holly also pulled double duty. 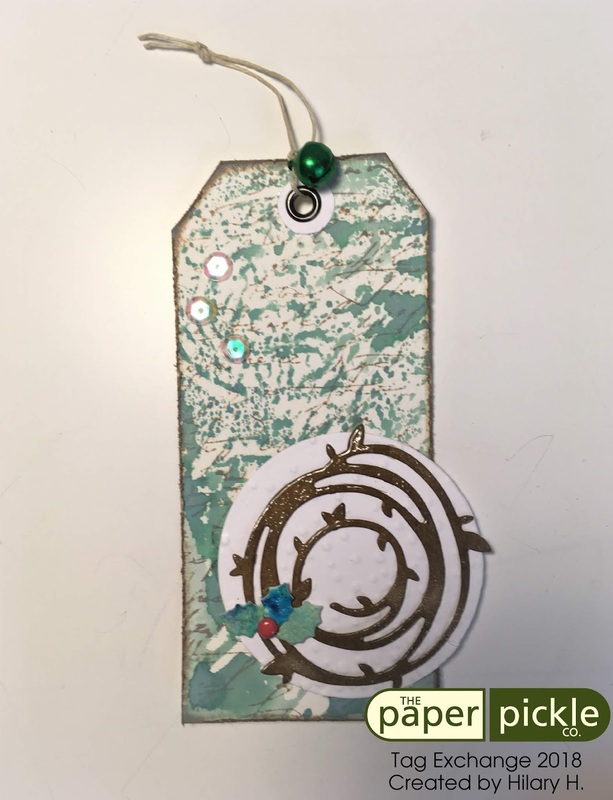 This is her first entry which has a nice earthy feel. 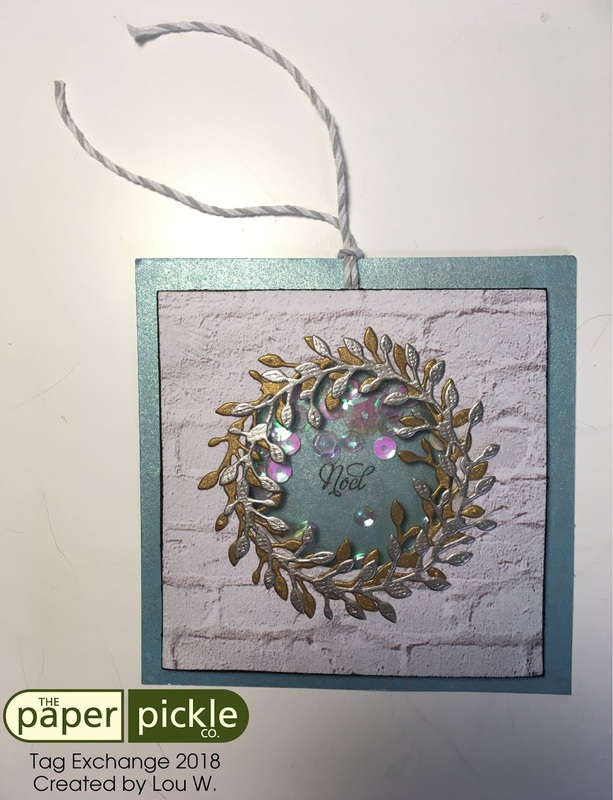 The trees were die cut and then Holly applied Prima's Art Alchemy Metallique wax in bronze to create a gorgeous shine. The red polka dot washi at the bottom added a beautiful pop of colour that really set off this tag. Love it! Merry Christmas, eh?!? 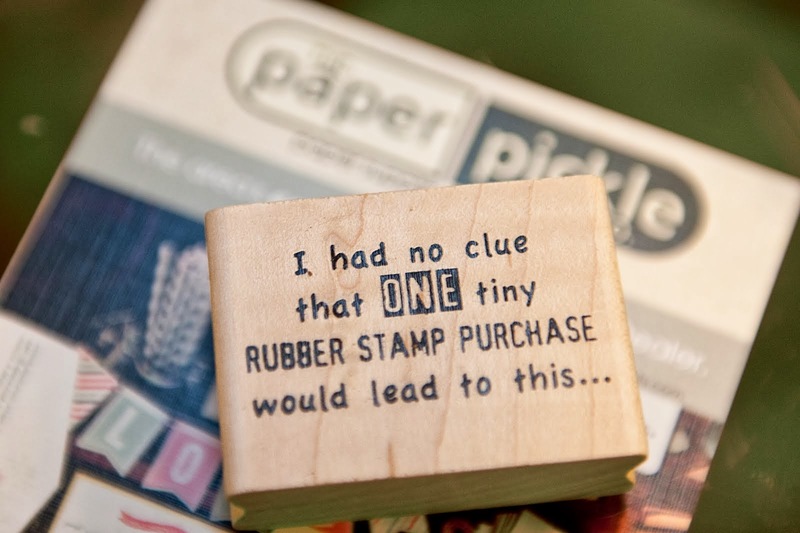 Oh this stamp and die by PhotoPlay is adorable! This is a simple tag but it's all about the placement and little details that make this tag stand out. The red and black colour combo is perfection. The wooden snowflake and baker's twine is awesome. 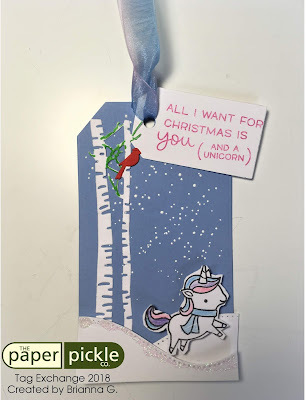 And I love how Holly put Santa and the washi tape on angles. This made the tag very interesting and whimsical. Jody has created the most perfectly, beautiful, feminine tag. I adore the banner style shape of the tag. 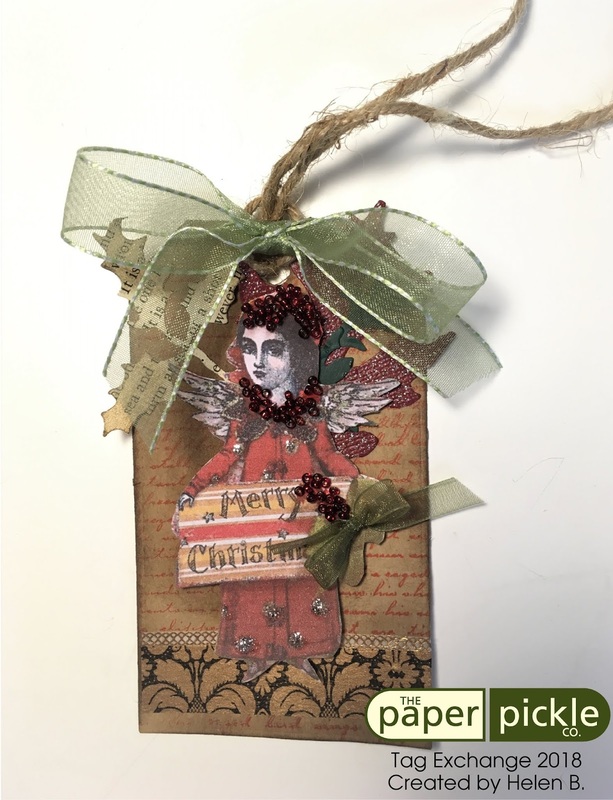 I love the soft frosty mistletoe greens paired with the cameo shimmer cardstock. AND....if you look closely, you will see that Jody hand stitched/crocheted around the oval layer. Oh my! I want to learn how to do that! Oh Julia H.....you are growing up! Like any good crafter, she did her research and was inspired by a similar tag she found on Pinterest. 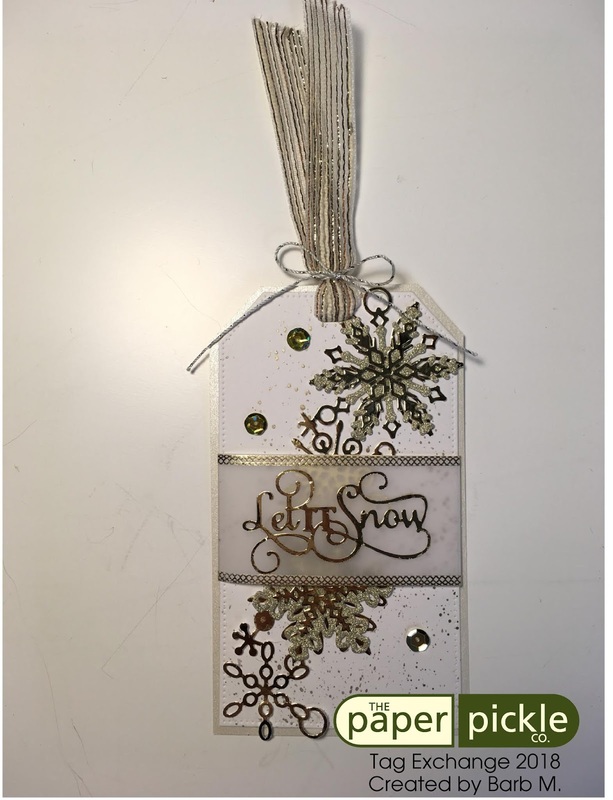 The large white snowflake was heat embossed in white. 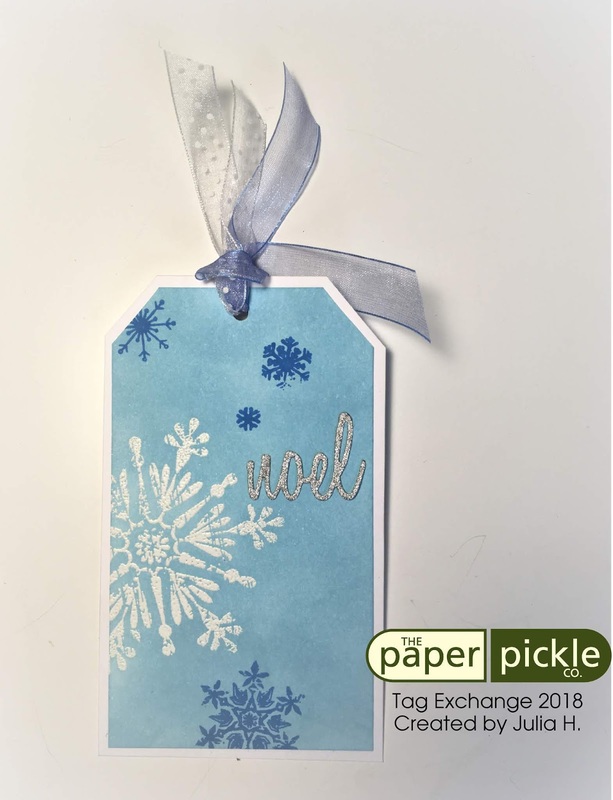 Julia then added various shades of blue oxide inks to flood her tag. The darker blue snowflakes were then stamped in oxide inks. 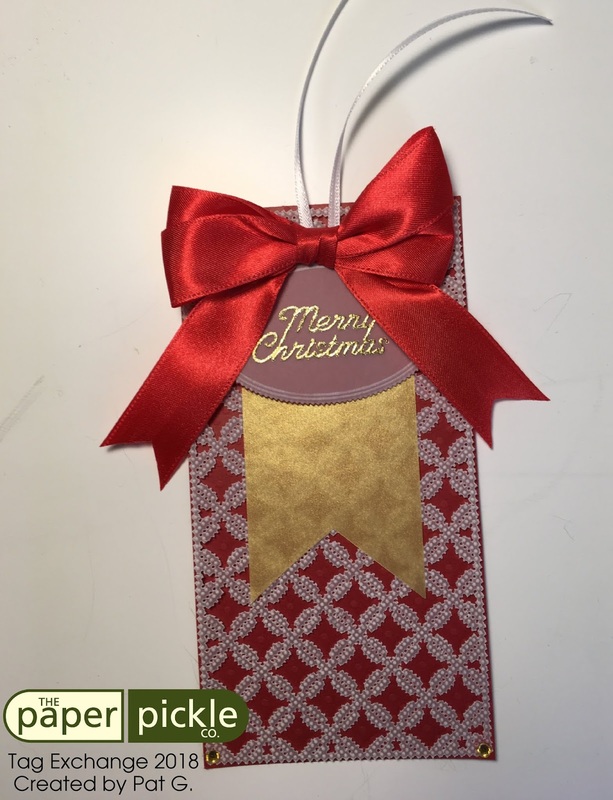 The glittery "noel" and ribbon really dressed the tag. Very nice, Jules! Oh Kell! 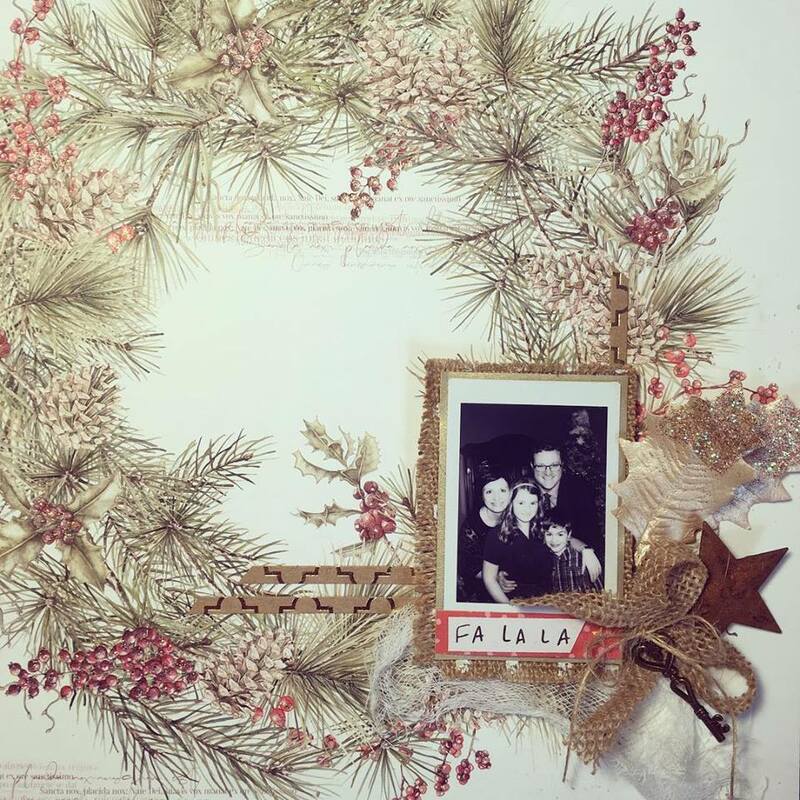 This Polaroid of a snowman family is perfection! 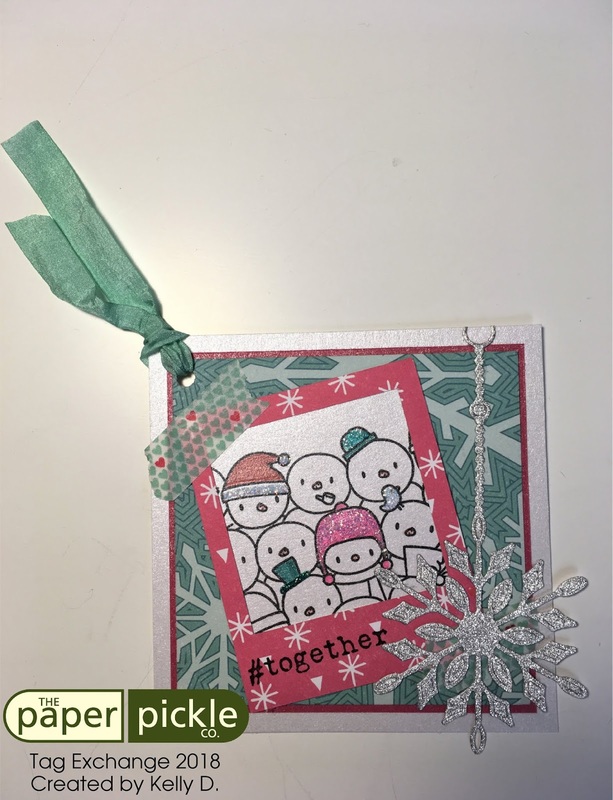 I love the bright colour choices (the teal snowflakes are on the front of this double sided paper and the hot pink on the back). 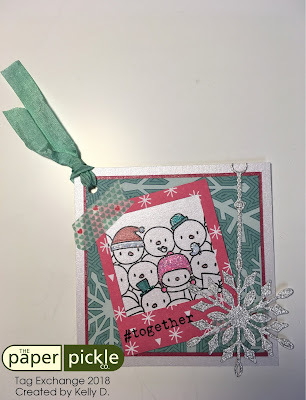 The heart washi tape is awesome and I adore the classy snowflake ornament. 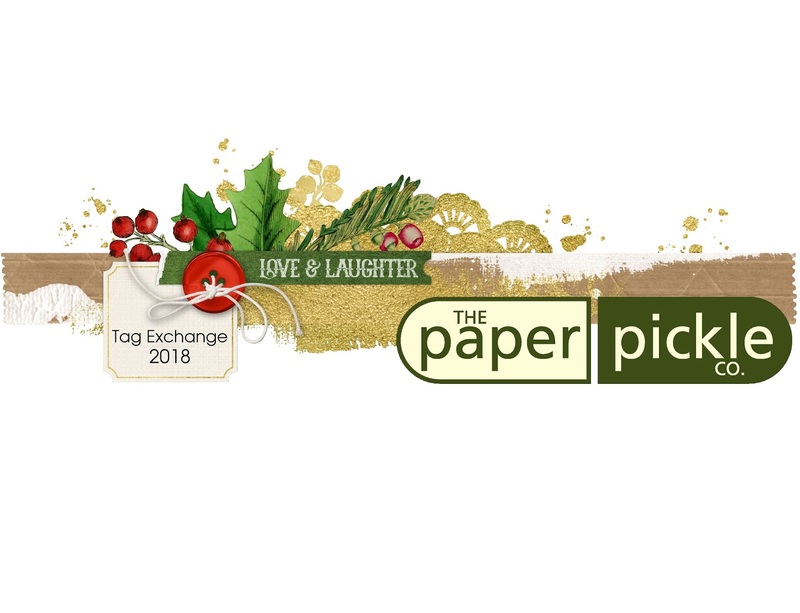 I'm SO glad you joined our swap this year! Yep this is mine. I really struggled with my design (you should have seen my failed attempts!) but I landed on a tag that was somewhat inspired by this 12x12 layout I created (see below). There were similar elements including the rustic dimensional star and burlap. I worked with this beautiful Magenta stamp and added the perfect touch....the word "believe". I love how it turned out. How does paper make me so happy?! This is another tag you have to see in person. 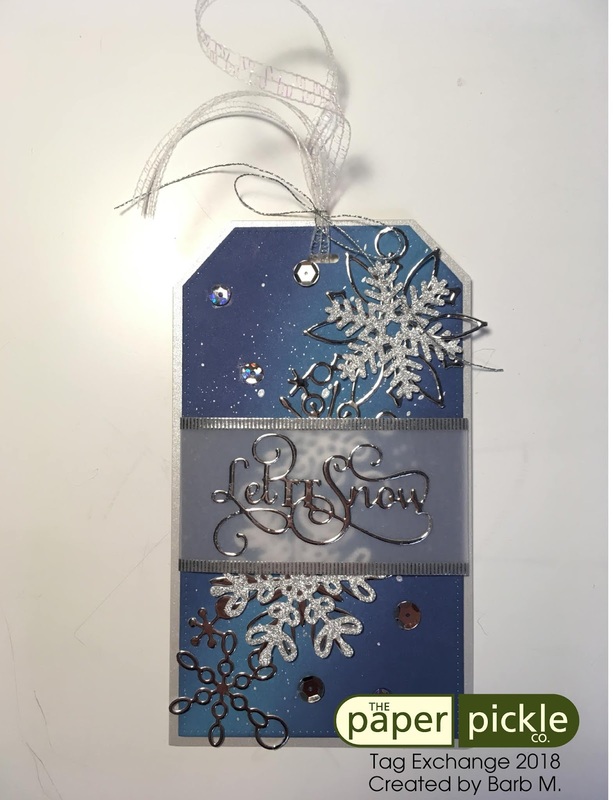 It is a very elegant shaker tag with stunning blue, gold and silver shimmer papers....even the sequins sparkle. I love the little "Noel" in the center of the tag. Very nice, Lou! Pat has created a very striking tag. The brilliant reds and golds really catch your eye. But it is when you look closely that you will see the fine detail. Pat has been showing me her pergamano creations over the years and they are incredible. Pergamano is a paper art where the artist works with vellum to create magnificent backgrounds by piercing, stippling, embossing, etc. Zoom in on the white lattice background and you will appreciate this art. Gorgeous, Pat. 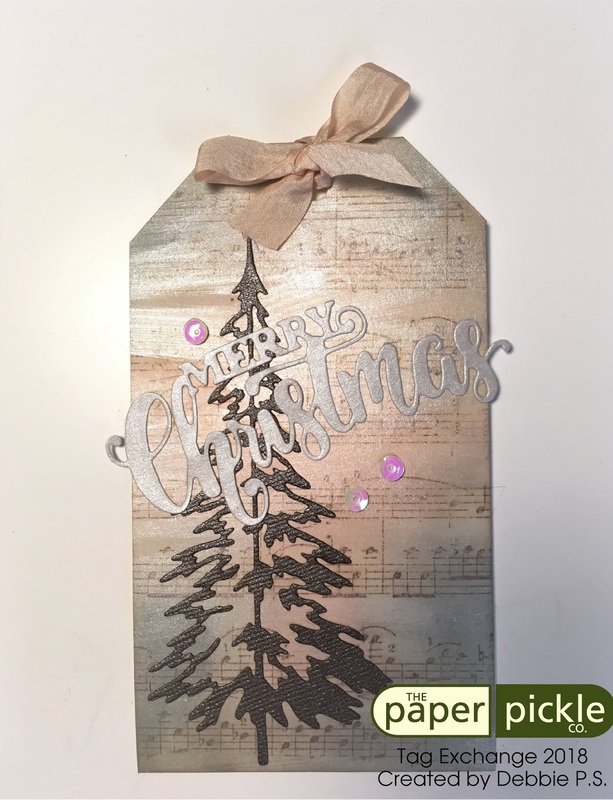 Sandi has created a gorgeous tag using shades of silver, pinks and burgandy. What a beautiful colour combo! She too has created a stunning winter scene using various dies. 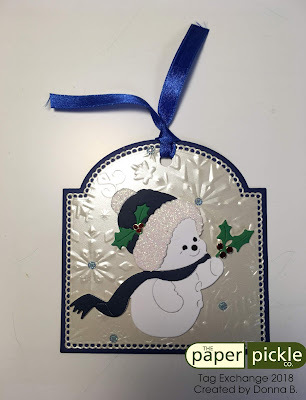 I love the embossing folder she used to dress the top of her tag. Awesome! So what do you think? We have some incredible talented people in our community! Keep shining and keep playing! Happy 2019....all the best always!